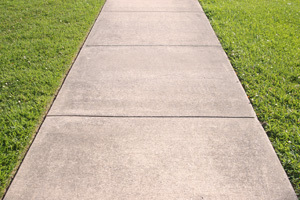 Does your existing concrete sidewalk have cracks or bulging rises from roots, weather or age? This unsightly damage is more than just an eye sore, it can be dangerous for your family and guests, and could be a sign of an underlying issue that needs to be corrected. Whether your sidewalk needs a simple crack repair or a complete new installation, we’ll come assess the site and find a solution that fits you best. Domenico Parravano and Sons puts the quality craftsmanship we call “Roman Style Concrete” into every sidewalk we install, repair or replace. We’ve been helping homeowners with their residential concrete sidewalks in Baltimore City, Towson and Baltimore County since 1977. Any concrete sidewalk installation is only as good as the base you start on. We begin a project by ensuring a correct grade is in place to provide proper drainage. Grading and sloping are also taken into account to create a uniform thickness. We compact the base material to provide a solid, level base. Natural movement in the soil can’t be avoided in most situations, so control joints are installed at correct positions to allow for controlled shifts and movement that will keep the integrity of the sidewalk in place. Stamped Concrete: The high-end look of stone or brick can be accomplished at a fraction of the cost by imprinting patterns in new concrete. Colored Concrete: Choose from traditional shades of white and gray or more vibrant colors that can make a bold statement of blend in with your landscape. Exposed Aggregate: Adding exposed gravel an aggregate to the concrete mix can create a unique texture and add skid resistance. Concrete Pavers: Pavers offer versatile design options for color, shape and texture. In addition, pavers are easy to replace in sections if necessary.